“When I first told my daughter I was going to work for Delta, she asked me if that meant she got an extra Coke,” said Dawn Kimmich, Assistant General Council, when sharing an anecdote over the P.A. system. Her 8-year-old assumed the only space for female airline employees was being a flight attendant when her mom joined Delta after 20 years of legal experience. And while Delta is hiring 1,500 flight attendant positions this year, there are also additional opportunities across the airline as it plans to hire more than 25,000 employees over the next five years. 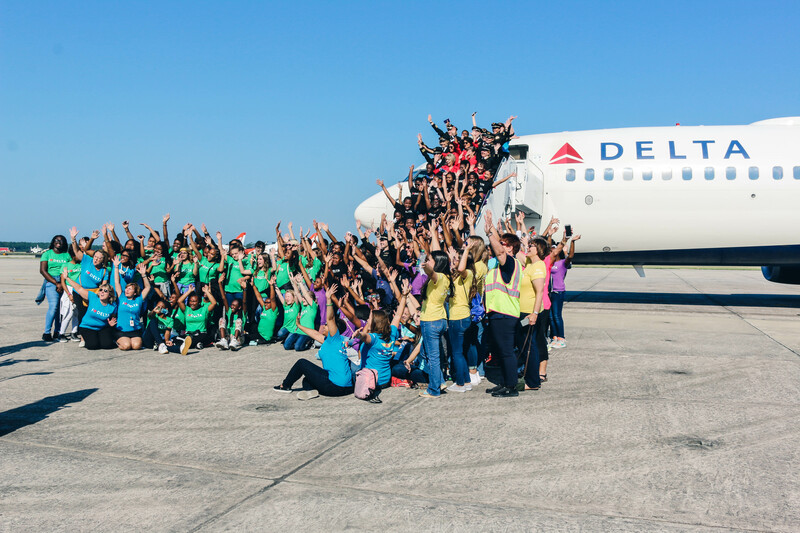 On Saturday, Delta launched its third annual Women Inspiring our Next Generation (WING) flight to expose young girls to aviation careers on Girls in Aviation Day. From gate agents at takeoff to the ramp agents receiving the plane to the 115 students on board, the flight was entirely female. "Even the dispatchers we spoke with over the radio on the way to Pensacola were women," added Captain Katherine Reynolds, mentioning the flight's thoughtfully crafted details and execution. The flight departed from Atlanta early in the morning en route for Pensacola, where the students explored the National Flight Academy. The Atlanta-based girls from ages 12 to 18 had a range of exposure to flying before the WING flight. Out of 40 students sent from one of the schools, only three of them had ever flown before. Girls currently enrolled in flying lessons also joined, finding a chance to connect firsthand with mentors and role models. Throughout their day at the Flight Academy, the girls tried out different roles. They were given a chance to navigate as a team, communicate as a team, and fly an actual route as a team in the Naval simulators. It gave them the experience of a real aviator: as pilots depend on air traffic control from takeoff, speak to dispatchers who are calculating weather, and operate the aircraft with co-pilots and a crew from the ground up. And the girls were completely okay with the "no boys allowed policy," CBS wrote. The WING flight originated as a response to a male dominating industry – as 5.14 percent of pilots in the United States are female. In addition to Captain Andi Tart who the girls heard coming from the cockpit, female first officer Crystal Barrois accompanied her and showed a seven-month pregnant belly. "We want to show the girls you can have a family and a career at the same time," said Barrois. "The lifestyle of a pilot and a mom are not contradictory – they actually complement each other." The cabin was full of other powerful Delta women celebrating feminine spirit and talking to girls about their careers in aviation. 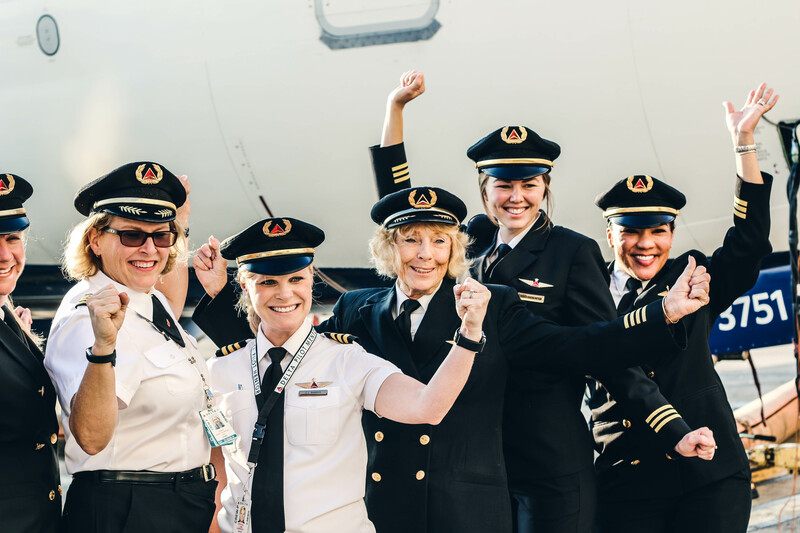 The nine pilots on board were joined by female mechanics, engineers, technicians, IT specialists, communicators, reservation agents and creatives who work at Delta. "My point isn't them – it's you," Lt. General Duane Thiessen, CEO of the National Flight Academy, said to the girls about the success of other women in aviation. "The only difference between them and you is that they made the decision years ago that this is what they wanted to do. Every one of you can do what they did." "People think it's easier, and it's not gotten any easier; we're just looking at the people who have made it. 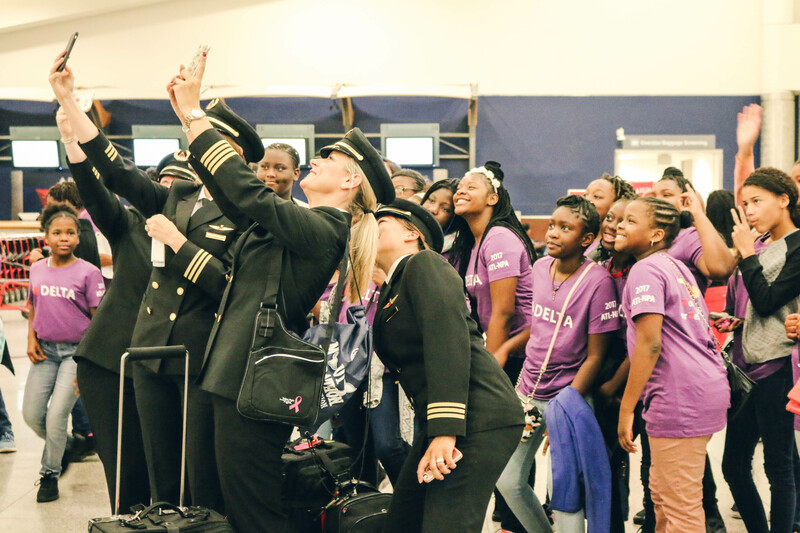 It's up to us to keep reaching out to young women in aviation and convince them that this job is for them – not someone else," said Delta’s first female pilot, retired Captain Joy Walker, believing girls are a force to be reckoned with. Females typically only joined commercial aviation after flying in the military before Walker paved the way. The girls also got to hear from USMC Captain Corrie Mays, 34, the second female pilot to be a Blue Angel. She encouraged the students to follow their dreams, whether that's being a technician, business woman or frontline employee, and empowered the girls to believe they have much more than pretty faces, but wonderfully capable minds, too. "Now, my daughter knows there are a lot more options in aviation in addition to being a flight attendant," Kimmich added. "And now she gets an extra Coke from time to time, too."